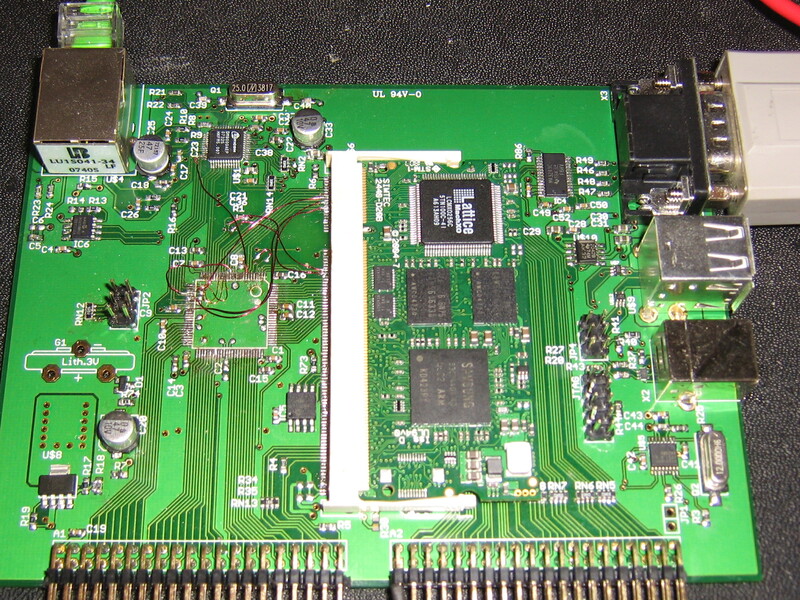 This page contains a record of problems found so far with the CT-PC89E, a very new design of ARM 8.9in netbook. As they are corrected, the issues will be removed. machine left on overnight resulted in "LCD burn" probably due to kernel crash resulted in brightness of LCD being pushed beyond limits (a common problem on embedded systems). can only really be fixed by a hardware watchdog timer, resulting in power-down. further reverse-engineering of the binary kernel shows that yes, there appears to be no hardware watchdog timer, and several "shutdown" sections of linux kernel code have been hard-hack removed, and replaced with a simple GPIO-based hardware power-down sequence. Plastic button activiating Reset pushed in (!) after use only about ten times. still works but care now needed. layout of filesystem is not FHS compliant. kernel modules have been moved to /drivers instead of /usr/lib/modules/2.6.24.2/kernel/drivers, violating FHS compliance and absolutely guaranteeing future problems with system upgrades. debian packages on MOS mid-fun operating system violate FHS and standard debian policy: many packages install identical files TWICE, some of which are in an indentical file-structure under /READONLY_FS. this should NOT be done: the files should be copied manually, or installed using debootstrap into /READONLY_FS but NOT added twice into one package. on 3G dialup (vodafone USB modem), pppd segfaults (presumably kernel problem) under Debian, and machine becomes unreliable (indicating kernel problem). this can be fixed by providing the kernel source code. on 3G dialup (USB modem used by adam), again it fails. kernel source DEFINITELY needed. root password was cracked within 4 days, by running "john" on /etc/passwd, and found to be "mos2010"
/sbin/udevd and other applications run as root are owned by midfun, allowing them to be replaced and perform root operations under user control. screen brightness control is non-linux-compliant: there is no standard entry (that could be found) in /proc or /sys for the LCD brightness, making it impossible to use standard linux applications and distributions. this can be fixed by providing the linux kernel source code. the built-in microphone doesn't seem to work, or if it does, the kernel drivers are borked and don't make it available under ACPI. speakers work fine though. The newly-developed http://gitorious.org/xf86-video-s3c64xx which is 20x or greater speedups cannot be used because the linux kernel source is not yet available, in order to add it. lkcl: after dropping the machine (entirely my own fault!) onto a wooden floor from a height of 15in, it fell onto the power lead and ethernet dongle side. the ethernet dongle is now also fairly loose, and requires to have gravity-assistance (dangling) in order to maintain an ethernet connection. not entirely sure what to recommend, here, because the connector is about as small as you can get, and there's simply no room for the height or width of a "standard" RJ45 connector, because overall the machine is really very thin. the macbook "air" design springs to mind, with a hole in the underside and an approx 30 degree angle on the RJ45 connector, but... on a low-cost netbook, that would seem to be a bit of a mad design decision. the NAND flash is compiled with ext4 tools, then marked as ext3. the kernel is then only compiled with ext4 driver, from 2.6.24.2 which is KNOWN to be UNSTABLE. this will (and is already) cause problems. using IDApro to analyse the disassembly of __apm_get_power_status it looks like GPIO Bank N pin 2 is used as a multiplex selector to choose the source for the S3C ADC input. no mutex locking is in evidence on the GPIO Bank N pin 2, thus making a race condition quite possible and thus resulting in corrupted ADC input. osx-style rollerbar at bottom did not start up on first boot. mouse trackpad was inoperable when machine started up when low on battery. inserting power cable, mouse trackpad was fine. Application manager allows to install some additional packages, but installation of gnome-games resulted in errors (unrecognized format of SVG files) when trying to play them. Missing dependency I guess. evbug is compiled in causing major spam of dmesg (making it unusable). It is also a security issue as it means all keystrokes get logged. And it probably reduces performance somewhat. I also have had multiple times that kbd and touchpad are dead after boot. This page was last edited on 13 April 2011, at 14:47.